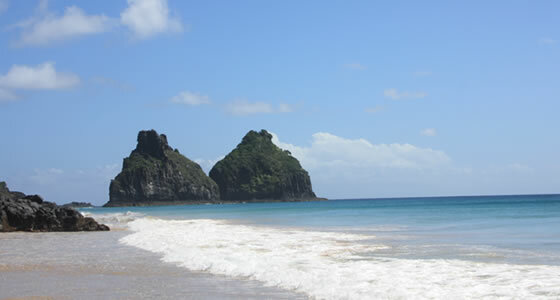 Hotels, Pousadas and Accommodations in Fernando de Noronha. All you need to know before you book your hotel accommodations in Fernando de Noronha. Benefit from our discounted rates in over 20 Noronha Hotels and Pousadas. Get advice from our team of local experts. Fernando de Noronha is a Brazilian archipelago. It has been named a World Heritage Site by UNESCO and is known for its exquisite beaches and exciting wildlife. There are approximately 70 pousadas and one hotel to accommodate travelers. They are rated one, two or three dolphins, instead of the usual star rating. The pousadas, similar to a bed and breakfast, are mostly situated in private homes. These homes have been altered to accept travelers. Some have even added on separate guesthouses or bungalows. The pousadas are mostly privately owned with the owner acting as the host or hostess. Like hotels, pousadas vary in their amenities and level of elegance and service. The most plentiful pousadas on Fernando de Noronha are the less expensive budget friendly inns. There are also moderate and elegant pousadas available. Approximately 26 pousadas on Fernando de Noronha are considered basic and inexpensive. These all rate 1 dolphin. They range from 2 to 14 rooms. Most of these pousadas can be found in the regions of Floresta Nova and Trinta. A few are also located in Floresta Velha, Boldro and Vila dos Remedios. Almost all of these budget pousadas have wireless Internet and comfortable hammocks placed strategically on the property. A few have outdoor swimming pools and many include breakfast at their standard price. There are 9 2 dolphins or middle of the road pousadas, scattered over the island. They can be found in the regions of Floresta Nova, Vila dos Remedios, Floresta Velha and Vila do Boldro. The only hotel on Fernando de Noronha is considered a mid-range inn. It has a restaurant, Internet, a pool and daily housekeeping as well as a bar and laundry service. The mid-range pousadas have Internet too and many have laundry service as well. Amenities do vary quite a bit however and some have a swimming pool, others a bar and still others a concierge to arrange adventure outings. The top end pousadas with 3 dolphins are considered the most elegant inns on the islands. They are located in Vila do Sueste, Vila do Boldro and Floresta Velha. These high-end inns are all equipped with wireless Internet and laundry service as might be expected. Many have spa facilities, a swimming pool, air-conditioned rooms, mini-bars in the room and flat screen televisions. These nicer pousadas may also offer activities such as boating, fishing, surfing, snorkeling and scuba diving. They provide room service and shuttle services. These pousadas usually have a few bungalows or apartments as guest quarters instead of just one building. They also tend to focus on environmentally friendly services using solar power, special water and sewer treatment and recycled constructions materials. There are beaches on both sides of the island. The beaches facing the coast of Brazil are very calm with little wind, except from November through April, when the winds do pick up and waves grow. Surfers will gather at this time to enjoy the majestic surf. Remember when booking a pousada, it is best not to visit on the continental side if you are not a surfer. The waters can be treacherous for swimming.The beaches on the outside of the island facing Africa are filled with wild aquatic life and are great for snorkeling and scuba diving. If these are your favorite sports then look for pousadas on this side of the island. Traveling on a budget to Noronha? First of all, it’s helpful to know that accommodations in Noronha are far from unexpensive. If you are looking for a superb Noronha vacation at a lower price, budget Noronha pousadas - which are pretty much fishermen houses that became charming bed and breakfasts - are probably the right pick for you. Fernando de Noronha offers a number of pousadas “domiciliares”, with prices more associated with accessibility and less with luxury. Get the real touch of royalty, even in Fernando de Noronha. Taste a piece of heaven with royal suites at the luxury pousadas in Fernando de Noronha. Treat yourself to the finest delicacies, best service, awesome views and expensive suites in the island. The best hotels are the Pousada Maravilha, Poudsa de Teju Acu and Pousada Solar de Loronha. They are definitely worth every dolar you will spent. Considering the high prices charged in Fernando de Noronha for accommodations, you might be asking yourself what pousadas in Noronha represent a real good deal an a good value. Check our preferred Noronha pousadas, If you are trying to avoid both the high end and the budget lodgging options. Talk to our experts and get Free advice on your Noronha accomodations. Learn what activites are available at the time you visit. Get some tips on what cities you should visit in the way to Noronha as well as tips to avoid the always expensive Noronha airfare.